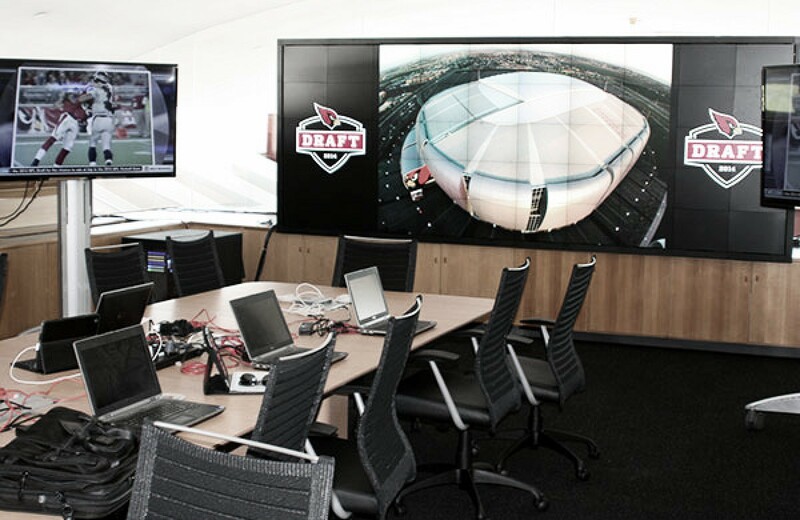 With the NFL Draft just under a month away, buzz and anticipation have been growing as to who the Arizona Cardinals teams are linked to which high profile player to help make their team better. The Cardinals have nine selections in this year's draft. The Arizona Cardinals are in an odd position. It has been said that if they want one of the better quarterbacks in the 2018 NFL Draft class, they will have to trade up or they can roll the dice and pick the best player available to help fill a need. If they stay put, the Cardinals will make their first selection at No. 15 in the this year's draft. The need for a quarterback is just the tip of the iceberg. The have a big need at wide receiver, cornerback and both the offensive line and defensive lines. We are officially one month away from the NFL Draft. Here is how the Arizona Cardinals draft class could shape up. In this scenario, Arizona stays put and selects Lamar Jackson. Jackson looks like he could be the perfect quarterback for today's National Football League. Jackson has the size (6'3, 200 lbs) and speed that teams desire in a mobile quarterback. 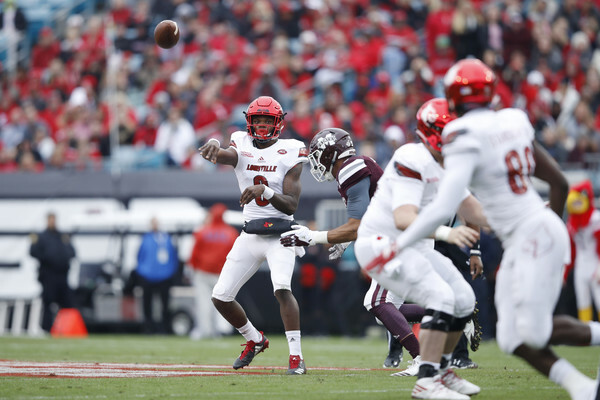 In three seasons at Louisville, Jackson threw for 9,043 yards and 69 touchdowns. Jackson also rushed for 4,132 yards and 50 touchdowns. Jackson also comes with a list of accolades. He won the ACC Offensive Player of the Year, 2016 Player of the Year, the 2016 AP Player of the Year and the 2016 Heisman Trophy winner. Accuracy would be the biggest knock on Jackson. Although he did improvement while at Louisville, Jackson never completed more than 59% of his passes. That can be improved upon as he will most likely sit behind Sam Bradford for a season. Arizona would hit a home run with this pick. Just imagine an offense that featured both Jackson and running back David Johnson. Scary isn't it? The second biggest need for the Cardinals is at wide receiver. As of now Larry Fitzgerald, Cobi Hamilton, J.J. Nelson, Chad Williams and Brice Butler make up the wide receivers group on the roster. Fitzgerald is the only reliable receiver the Cardinals have. Insert Christian Kirk. Many feel Kirk is high on the Cardinals wish list, as Budda Baker was a year ago. Arizona may want to move up a couple of spots if they want their guy. Kirk is a local product, born in Scottsdale, Arizona and played high school football at Saguaro High School in Scottsdale. 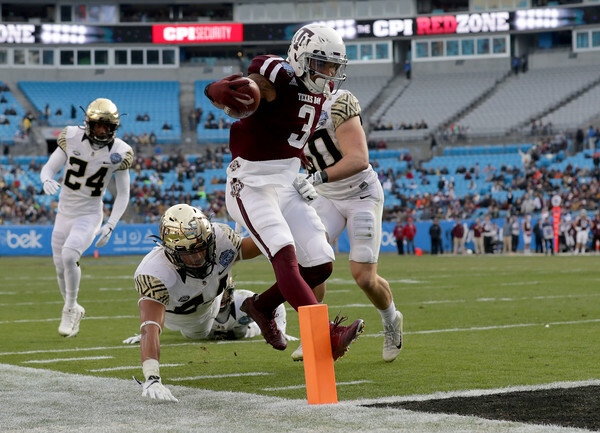 In three seasons at Texas A&M, Kirk caught 234 passes for 2,856 yards for 26 touchdowns, finishing third in the SEC last season with 10 touchdowns. He would be a valuable slot option for the Cardinals and would give them another reliable go-to option. 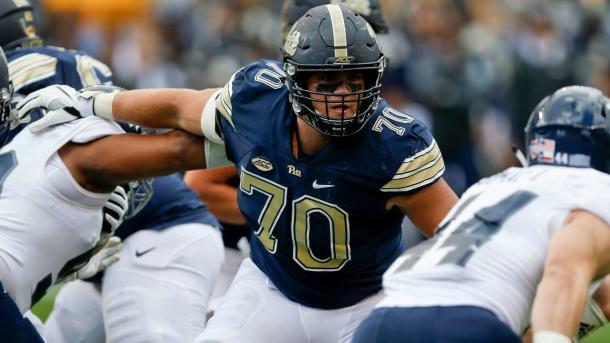 Coming into his freshman season at Pitt, O'Neill wasn't even an offensive lineman. O'Neill came in as a receiving tight end. An injury on the offensive line opened up a spot for O'Neill and he never looked back. O'Neill played and started in 37 consecutive games to finished out his career. In 2017 O'Neill started all 12 games at left tackle. He would go on to earn All-ACC selection by the Associated Press and was a Third-Team All-ACC selection by the Atlantic Coast Sports Media Association. At 6'7, 297 lbs, O'Neill has good length and tremendous size to play at the next level. He would be a great addition to a Cardinals offensive line that could use the depth. LSU has been good to the Arizona Cardinals. Patrick Peterson, Tyrann Mathieu, and Kevin Minter all came from LSU. 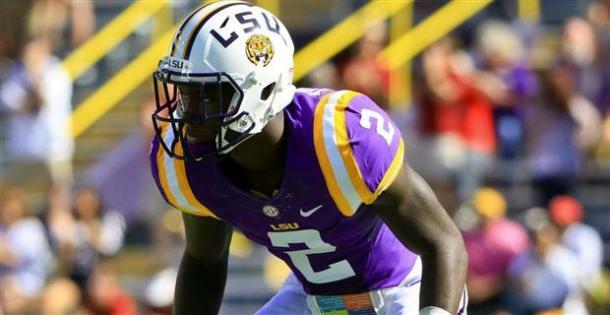 With their second pick in the third round, the Cardinals once again will go to the LSU well and draft the corner they are looking for in Kevin Toliver. At 6'2, 192 lbs, Toliver has great size and an intimidating presence in press coverage. He plays off blocks very well and can disrupt passes while making receivers change their routes. During his freshman season, Toliver recorded 35 tackles with five passes defended and one interception. Although his play fell off in 2016, Toliver picked himself back up in 2017, recording 27 tackles with 10 passes defended and one interception. One of the biggest red flags against Toliver is his character being in question. The last time the Cardinals took a chance on an LSU player with character questions and bad habits worked out very well for them. With the Cardinals crossing off most of their needs of their list on the first three rounds, Arizona has the luxury of going with the best player available. 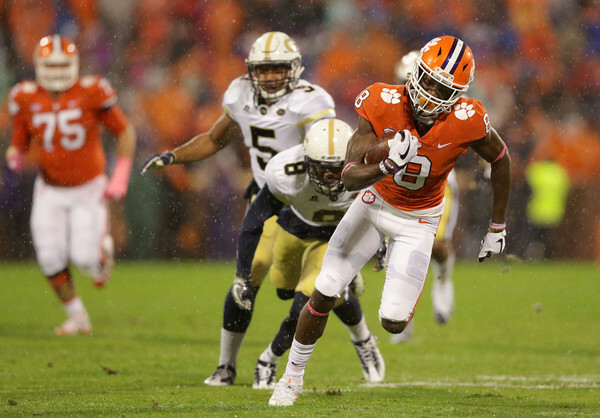 Adding Deon Cain adds depth to the wide receiver room. During his time at Clemson, Cain caught 130 passes for 2,040 yards and 20 touchdowns. In 2017, Cain finished in the eighth in ACC for receiving yards (734) and in 2016 he finished ninth in receiving touchdowns. Cain has the speed to get deep down field and is willing to go up and fight for passes with corners. He has burst speed ability after the catch and is a red-zone threat. According to Mike Jurecki and Bertrand Berry of Arizona Sports 98.7 The Blitz, Arizona will be switching to a 4-3 defensive scheme. With big question marks surrounding former first round pick Robert Nkemdiche, Wicker could be brought in to compete. While in high school, Wicker was schooled by former NFL linebacker Antonio Pierce. Wicker's play on the field showed he was absorbing the knowledge, as he recorded 138 tackles and 17.5 sacks in 12 games as a senior. 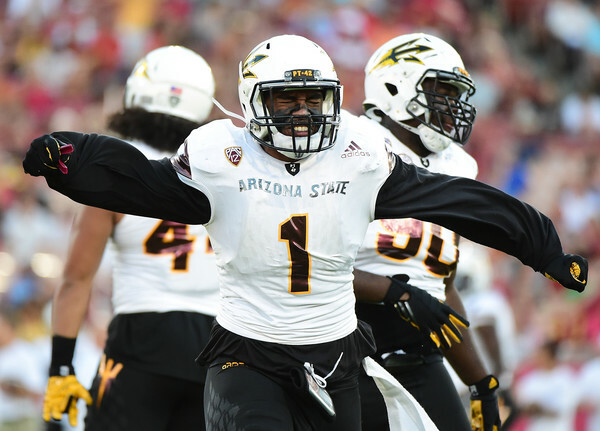 During his time at Arizona State, he racked up 102 tackles, with 32 tackles for a loss, and 12.5 sacks. He also defended four passes and forced two fumbles. He might struggle as an interior defensive lineman, but, with the right coaching Wicker could turn out to be a surprise for the Cardinals. In the sixth-round, Arizona adds to the defensive line with the selection of Marcell Frazier. Missouri has become a hotbed for pass rushers as of late. Frazier could follow the likes of Charles Harris, Shane Ray, Kony Ealy and Sheldon Richardson. 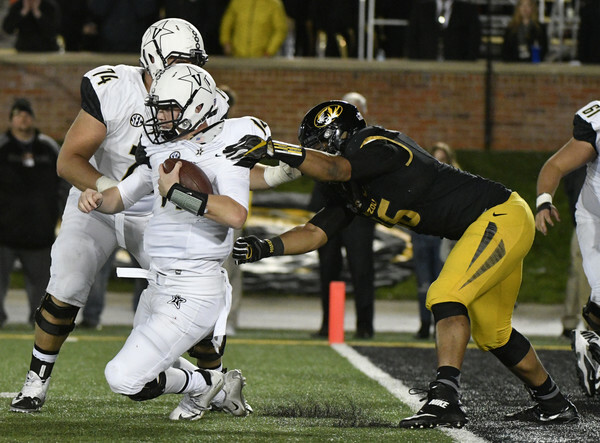 Frazier has a knack for getting the opposing teams backfield as he totaled 31 tackles for a loss and 17.5 sacks in three seasons at Missouri. He will have to improve his footwork and his ability to stop the run. He also needs to become more physical at the point of attack. He will also need to improve his speed. Pairing him with former Tiger Markus Golden, Frazier could excel at the next level. Flowers impact was felt immediately at Oklahoma State. 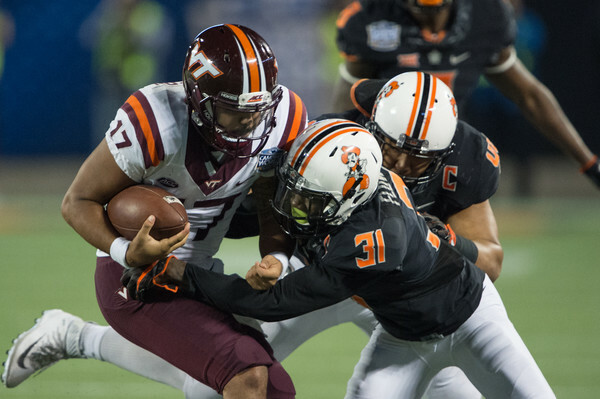 Starting at strong safety as a redshirt freshman, Flowers made 56 tackles in 12 games in 2014. He would go on to talley 284 tackles, 25 passes defended, four interceptions and four force fumbles with one recovered. At 6'3, 202 lbs, Cardinals fans have a reason to be excited to potentially land a player like Flowers. His combine results compare to those of Cardinals favorite Adrian Wilson and division rival Kam Chancellor. Flowers is a long-armed, lanky safety with solid instincts but has limitations. His movements do not look natural but he has good play making ability. With the loss of Tyrann Mathieu, it wouldn't be a bad idea for the Cardinals to take a chance on a guy like Flowers.